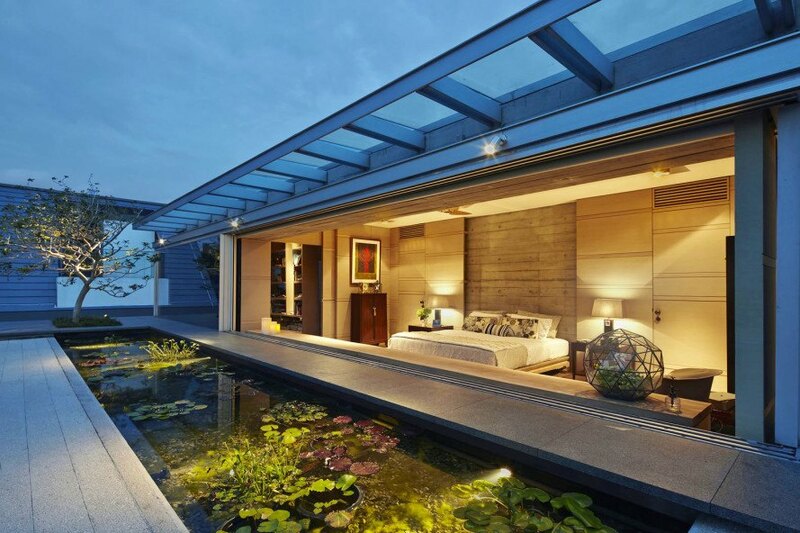 This concrete family house on Chiltern Drive in central Singapore was designed to accommodate the needs of each of its inhabitants, with private spaces and common areas having the same exacting level of detail and atmosphere. 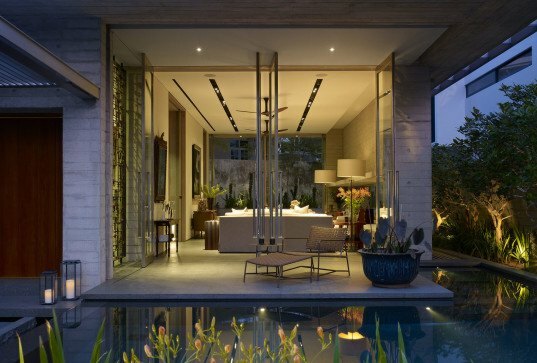 Singapore-based WOW Architects | Warner Wong Design weaved together concrete, steel and timber elements to create balanced spaces that would "remind the family of the effort, desire, and realization of their dreams". The house features woven steel reinforcement and raw timber formwork combined with concrete walls, creating deep spaces and extensive windows. A large swimming pool dominates the rear garden, while the large windows provide a direct connection to the landscape. The spaces were designed to provide optimal levels of privacy for each family member, while spacious common spaces allow them to come together. The expansive kitchen island that extends across the tall and grand kitchen runs parallel to a broad view of the rear garden and makes the kitchen a bright and pleasant room. The square geometry of the house combines deep and large spaces and connections that stretch across its length. The house features woven steel reinforcement and raw timber formwork combined with concrete walls, creating deep spaces and extensive windows. A large swimming pool dominates the rear garden, while the large windows provide a direct connection to the landscape. The spaces were designed to provide optimal levels of privacy for each family member, while spacious common spaces allow them to come together. The expansive kitchen island that extends across the tall and grand kitchen runs parallel to a broad view of the rear garden and makes the kitchen a bright and pleasant room. The square geometry of the house combines deep and large spaces and connections that stretch across its length.